This paper was put together following the CBx evening event in March 2016, which explored innovations in heat technology. In the UK, 44% of energy use goes into space heating and hot water, with the energy source for heating predominantly being fossil fuels. In order for the UK to reach its carbon targets, there must be a shift from fossil fuel energy sources to low carbon sources. One possible solution to assist the UK with this is through district heating. However, at present, the UK has one of the lowest participation in such schemes in Europe. This paper explores the innovations being made within the industry and specifically examines heat technology for district heating. 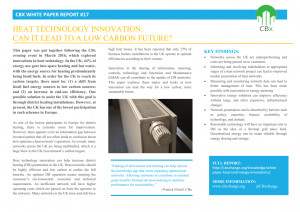 The outcome of the paper is to show how technology and trends may increase the penetration of heat networks in the UK and the rest of Europe, and ultimately lead to a more sustainable, low carbon future. With special thanks to our fantastic panel of experts; John Thompson, CEO at Environmental Treatment Concepts Ltd; Gareth Jones, Director at Guru Systems Limited; Colin Ashford, Chair of CIBSE AM15: Biomass heating; and Ashley Bateson, Partner & Head of Sustainability at Hoare Lea. To access our full white paper online please click on the button below. If you would like to download a hard copy of our whitepaper, there is an additional charge of £25.00 for non-paying members. Please get in contact with us at info@cbxchange.org and specify the title of the whitepapers you wish to purchase.